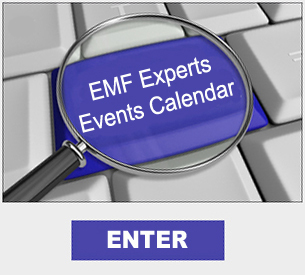 In our EMF Training Events Calendar you will periodically see free presentations offered. Here are some of the more popular ones that you can watch for in the calendar. Introduction to Certification Training is available by video 24/7 for your convenience, with a live presentation is scheduled about once every month, to enable prospective certification trainees like you to take the learning platform for a test drive, get a feel for your instructor, and find out if life as a Certified Professional EMF Consultant is for you. Wireless TechnoSmog - The Danger with Dazzle - this free presentations includes various topics pertaining to EMF Personal Protection from wireless technology commonly used in homes and offices. It is scheduled occasionally for special events, co-hosted with one of our Certified EMF Experts graduates. EMF Free Communities and Retreats is a Free Presentation takes you on a brief world tour of several established EMF-free communities, retreats and refuges, and to the southwest USA to learn more about the EMF-free community, Pueblo Quieto, that we are in the process of launching in Arizona. The calendar is where you will also be able to peruse and register for any of the webinar training formats below. Registration on the university-style learning platform is limited, be sure to register early to avoid disappointment. EMF Expert Training- training with instructor / student interaction conducted on-line with audio and visual aids. 2. The 6 Week Fast Track "EMF Expert Consultant" Live Certification Training course, designed to attain your certification doubly fast. 90 minute live classes twice weekly, for 6 weeks (Totaling 18 -20 hours of live instructor-led training plus self-guided training courses). 3. The "Ready When You Are" Self-Guided Training courses, designed for your convenience and to provide an inexpensive (non-certification) training, that may also be used as a stepping stone to certification credentials later, if desired. 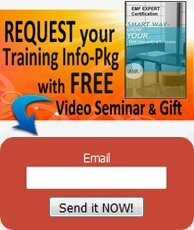 Self-paced video classes on key training topics of varying lengths and costs. Successfully passing this final exam results in EMF Expert Certification with a listing in EMF Experts Directory. 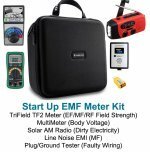 Price: See the calendar for various upcoming EMF Training Events course dates and prices. Course Outline: Check here for more course information and to request a detailed training info packet.